Sound familiar? You don’t mean to offend that unknown person, but well, you can’t help it. Save yourself the blushes and get Truemessenger, a new text messaging replacement app for Android that identifies unknown numbers (and does other cool stuff). Every time a new free mobile messaging app 5 Best Free Messaging Apps for Android 5 Best Free Messaging Apps for Android Need a free way to send messages to friends and family with your phone for free? Check out these apps. Read More releases, everyone starts talking about the death of SMS. Yet, text messaging is still huge, and hey, it’s not going anywhere. Truemessenger knows this and is here to make your messaging app better. Truemessenger is made by the the people at Truecaller, the publicly-sourced phone book. We have previously said that Truecaller is one of the top 10 Android apps everyone should install first Top 10 Android Apps Everyone Should Install First Top 10 Android Apps Everyone Should Install First Got a new Android phone or tablet? Then you absolutely need these apps! Read More . After spending a few hours with Truemessenger, we reckon that it might also deserve to be on that list. Truemessenger uses Truecaller’s phone book database to match phone numbers to people. You will need an active Internet connection, though. Truemessenger also prompts you to set it as the default app in Android How To Remove, Change, Or Set Default Apps In Android How To Remove, Change, Or Set Default Apps In Android The default way of changing your default apps can be annoying, but this app makes it super simple. Read More , but there is no need for this if you don’t want it as the default. In my testing, I saw the app get the name for every unknown number in my text messages. Admittedly, that was an anomaly, as I have never had the same luck with Truecaller. Like its parent app, Truemessenger probably won’t work every time, but it will work fairly accurately most of the time. Want to add a name to your phone book? Open the message, tap “Add to Contacts”, and you’ll be taken to your favorite contacts app What Is the Best Contacts & Dialer App for Android? 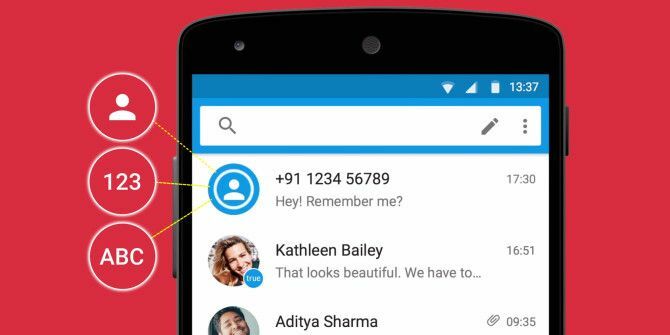 What Is the Best Contacts & Dialer App for Android? You don't have to settle for your phone's built-in contacts and dialer apps. Read More with the name and number fields already filled in. Incidentally, you might want to try Truemessenger’s sibling Truedialer, which is a fantastic smart dialer for Android Looking For A Smart Dialer App For Android? Truedialer Delivers Looking For A Smart Dialer App For Android? Truedialer Delivers Truedialer, a new app from Truecaller, can show you what unknown number you're about to call and can greatly improve the calling experience on your Android device. Read More . Text message spam is a big problem, but unfortunately, there is no Gmail-like spam filter for them in most SMS apps. Well, Truemessenger is here to change that. The first time you start the app, Truemessenger asks you to mark what is spam and what isn’t. Take the time and follow through with this. There’s a simple reason. In my case, I want text messages from my bank. I don’t want texts from other banks spamming me about their credit cards or “lucrative loans”. By selecting the unwanted banks and not selecting my bank, Truemessenger understood what I wanted. When I got an unwanted spam text from a bank, it smartly filtered the message to Spam. I quickly conducted an online transaction (for which I get text alerts), and that text alert landed in my inbox. Perfect. Apart from this smart filtering, you can send a message to the spam folder at any time. Plus, Truemessenger also has custom spam filters to block a number, block a series of digits in any phone number, or block a sender by name. Just for good measure, couple it with some of our tips to stop spam texts forever Stop Spam Texts Forever with These Tips Stop Spam Texts Forever with These Tips Spam texts are dumb. I could have provided a much more detailed introductory sentence, but I believe we can all agree here. Ever had this kind of moment? "Oh man! A new text message! Wonder... Read More . While Truemessenger excels at identifying unknown numbers and filtering spam, it is still missing some key features. You can’t filter messages to spam based on keywords. So if you don’t want any message that contains the word “realty” or “loan” to land in your inbox, you can’t do that. 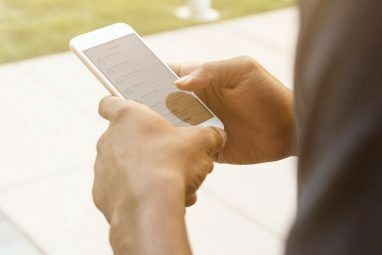 There is no quick reply or replying from notifications, which is a standout feature of many alternative texting apps that allows you to reply without ever leaving your current app. Truemessenger currently does not support Android Wear, so if you picked up an Android smartwatch like the Moto 360 Motorola Moto 360 Android Wear Smartwatch Review and Giveaway Motorola Moto 360 Android Wear Smartwatch Review and Giveaway The $250 Motorola Moto 360 Android Wear smartwatch fuses beautiful and sleek design with functionality. Read More , you won’t get texts from Truemessenger on your watch face. When you start Truemessenger, it asks for your basic details to log in: Your name, your phone number, your email address. This way, Truemessenger (and Truecaller) builds its phone book. It also asks for access to a user’s Contacts, cross-matching it with other users and creating a library of publicly sourced phone numbers. You get the option of selecting who gets to see these details: friends of friends, only by request, or anyone in the world. That’s the extent of your privacy control in Truemessenger, or in the Truecaller universe at large. 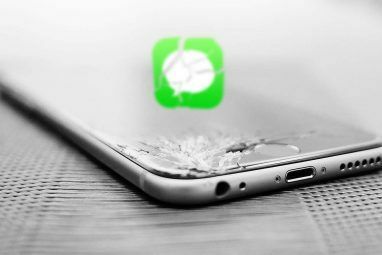 It’s not one of those messaging apps that take your privacy seriously Forget WhatsApp: 6 Secure Communication Apps You've Probably Never Heard Of Forget WhatsApp: 6 Secure Communication Apps You've Probably Never Heard Of The Electronic Frontier Foundation (EFF) is a lobby group dedicated to "defending civil liberties in the digital world". They maintain the Secure Messaging Scorecard, which makes for worrying reading for fans of instant messaging. Read More . Apart from the privacy, there’s also the security concern. The app is reading all your text messages, has access to your contacts, and so much more that it’s something to be wary of. Thankfully, Truemessenger told Techpp that the app processes data locally and doesn’t transmit messages to their servers. Only the sender’s number is transmitted to their servers. Can Truemessenger Replace Your Messaging App? Yes, you should install Truemessenger. But should you make it your default messaging app? That depends on how you use text messages. If you get a lot of spam and are mainly contacted by unknown numbers via text, then Truemessenger is worth it. Personally, that’s exactly what my usage is like, since I mostly use WhatsApp with WhatsApp Web Use WhatsApp Web on Your PC: The Ultimate Guide Use WhatsApp Web on Your PC: The Ultimate Guide WhatsApp Web is a quick and easy way to use WhatsApp messages on your computer. We show you how to use WhatsApp Web on your PC. Read More to talk to people I know. If the app is updated with quick reply and contact sharing, then sure, it can even be anyone’s default messaging tool. However, if text messaging with your family and friends is a big part of your life, then you’re better off sticking with one of the many great SMS apps for Android Text Better With These Alternative SMS Apps for Android Text Better With These Alternative SMS Apps for Android Don't like your default SMS app? Try a new one! Read More . In fact, you can even send and check messages on your PC How to View and Send SMS Text Messages on Your Computer How to View and Send SMS Text Messages on Your Computer Want to view and send text messages with your computer? These apps and services let you access SMS without your Android or iPhone. Read More with those. Right now, the app has been released only in the Indian Google Play Store, so Indian users can install it easily. Those outside India will need to download the APK and manually install or sideload it on their Android phone How to Manually Install or Sideload Apps on Android How to Manually Install or Sideload Apps on Android Want to sideload apps on your Android phone? Installing APKs manually on Android opens up a whole new world of apps, and it's easy to do. Read More . Do You Like Truecaller Apps? Why or Why Not? This release rounds up the trifecta of basic phone apps from Truecaller: a caller in the form of Truedialer, an SMS handler in the form of Truemessenger, and the original caller identification app that is Truecaller. Do you use apps from the Truecaller family? Are you okay with the privacy concerns as a trade-off for their convenience? Let us know in the comments! Explore more about: Contact Management, SMS, Spam. to gett guudance f?om someobe with experience. Any ?elp would b? enormously appreciated! Hi Mihir, if i block someone through truemessenger, will the sender be notified that I have blocked him..
Not working at all.. 5 by 5 for spammers. 32 spams out of 32 spams in my inbox, and TrueMessenger asked me 32 times, but didn't sent anything to spam box. 3 of them has very same text and same contact number to call. Here spammers use prepaid numbers, and discard them when they are out of quota. 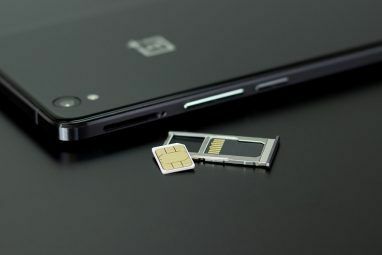 Just plug gsm sim card in, broadcast messages, remove them, and throw them to trash can, then plug another sim card. That's strange, it works perfectly for me, prdx. Which country are you in? Yup, as noted above, the app is currently in India only. But you can download the APK to install it in any country :) We have the link for that in the article, along with instructions in case you aren't familiar with sideloading apps. I dunno, maybe I'm old skool, but I usually take the few minutes of my weekday to go through my phone and delete numbers I don't recognize! I guess not everyone has that same luxury, but I really don't need another app "doing" something for me I can do perfectly fine myself! I think that's the problem with a lot of what's wrong in the world today, too many people are relying on too many apps to do things for them they should be able to do....things they USED to do! LoL! It's not about deleting numbers you don't recognize alone. I get so many texts from people whose numbers I don't have saved. This is just easier. And more than that, TrueMessenger's spam filter is fantastic. My inbox has never been cleaner. Truemessenger is an old concept in the new era. I tried it a couple of days back and it didn't last more than few minutes in my phone. Native messenger apps like Samsung's does better job without intruding into phone's privacy. There are so many inbuilt spam features in many security apps. This is so old. And I can't have an app exclusively for Spam Message filtering. It's a flop, I believe. It doesn't live up to the popularity of TrueCaller. Worst than TrueDialer. Just my opinion! Let's agree to disagree and move on :) I liked TrueMessenger far more than Samsung's built-in messaging app, or any of the others I've tried, especially for spam filtering. I meant to say when I have Truecaller installed on my phone and an inbuilt spam blocker, I don't need a stand alone app for it. Truecaller does a pretty good job. I just love it. But I don't think True messenger has a place in my phone. Disagreements do happen. It doesn't mean right or wrong. Just my opinion. My spam has gone up tremendously after I started using online services like food delivery, radio cabs, and so on. Truemessenger is a godsend! Truecaller doesn't work always, sometimes it will block a number, other times it won't block that very number. And if this app is made by them, the result will also be same. Truecaller will auto-block numbers only if you set it to do that. By default, it'll show a warning that a call is spam, but it won't auto-block it. Truemessenger works fantastically. I've been using it for 3 weeks now and it's now my default messaging app. I use TrueCaller and absolutely love it. But I really like Hangouts and probably wouldn't switch away from it. That being said, I will definitely give this a try and play around with it. If it's half the app that TrueCaller is, it will be pretty great. If you like TrueCaller, you'll like this. The spam filtering alone makes it worth having. Not compatible with any of my 3 devices, why not? Are you in India and running Android 4.4 Kit Kat or higher?